Six students have completed the Project Ag-grad program AND have returned to their homelands. THE SEVENTH HAS ALMOST COMPLETED HER PH.D.
Gbadebo Olaoye, Ph.D. inPlant Breeding, 1990. Dr. Olaoye is a Senior Lecturer, Department of Agronomy and Associate Research Fellow, Sugar Research Institute, University of Ilorin, Nigeria, where he develops drought-varieties of sugarcane and maize. He has published over forty articles in local, national, and international journals. GeoEnvironmental Services in South Africa. He participated in the development of land use and business plans for the Department of Land Affairs in Land Restitution programs in South Africa as well as the establishment of plantations in Ghana for biofuel productions. Tsitsi Ndowora Nyamupingidza, Ph.D. in Plant Pathology, 1998. Dr. Ndowora worked as a plant virologist in Harare, Zimbabwe and is now working working with a food scientist to promote the use of plants native to Zimbabwe to improve nutrition and food security and to maintain plant biodiversity. Jenipher Bisikwa, Ph.D. in Agronomy, specializing in weed science, 2004. 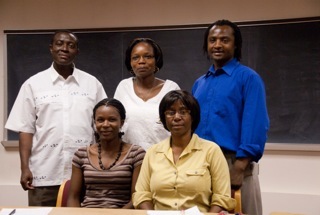 Dr. Bisikwa is on the faculty of agriculture at Makerere University, Kampala, Uganda. She is a mentor in the African Women in Agricultural Research and Development Program. Council in South Africa. He leads research programs in cereal breeding and biotechnology and trains graduate students in a range of fields including Plant Genomics, Molecular Genetics and Biotechnology for the improvement ofce real crops. He serves as Editor and Associate Editor for several journals. Position at the Danforth Plant Science Center. Once she completes her training, she intends to go back to Zimbabwe to continue research in corn genetics either at the University of Zimbabwe or at the national agricultural research center. ama Ao, Ph.D. in Applied Plant Sciences, projected fall 2016. Sama will return Nagaland (in northeastern India) once she has completed her training.